As you probably know, the Boy Scout’s motto is Be Prepared. When my sweet John gets sick (which is rarely, but right now) all he wants is my homemade chicken soup. Nothing against Jerry’s Deli, but homemade is better, as its secret ingredient is LOVE. Lucky for John today, I’m prepared and just whipped up some soup in about half an hour. The key is having two ingredients in your freezer: plenty of homemade chicken stock and a cooked piece or two of chicken breast. You’ll see from a previous blog post on taking stock how much I enjoy making homemade chicken stock. I usually have carrots and celery on hand, along with John’s favorite Ramen or Soba quick-cooking noodles. That’s all you need. Dice two carrots and two stalks of celery and sauté in two tablespoons of butter for four or five minutes in a large pot. Chop up your defrosted chicken pieces and add them to the pot for a minute or so. Then add your defrosted stock. I like a lot – 3 quarts. Let it simmer a while – the longer the better to marry the flavors. 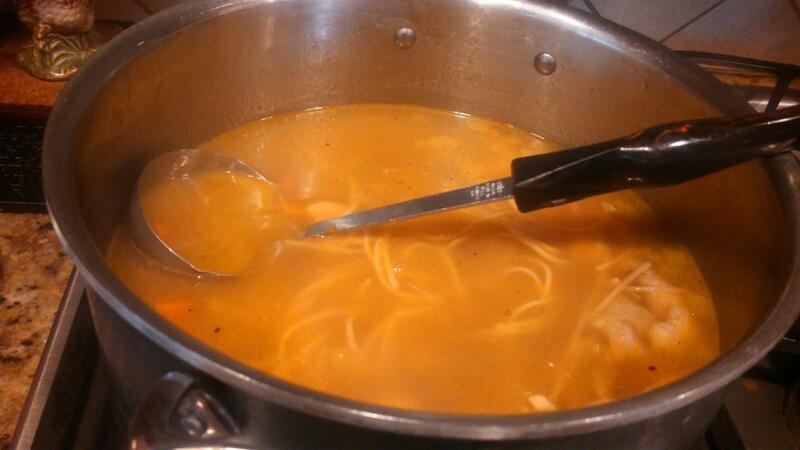 Before serving cook the noodles a little al dente, add them to the soup and serve. If you don’t have noodles, use a cup of cooked rice. Let me know if you get a chance to make this and how you like it!